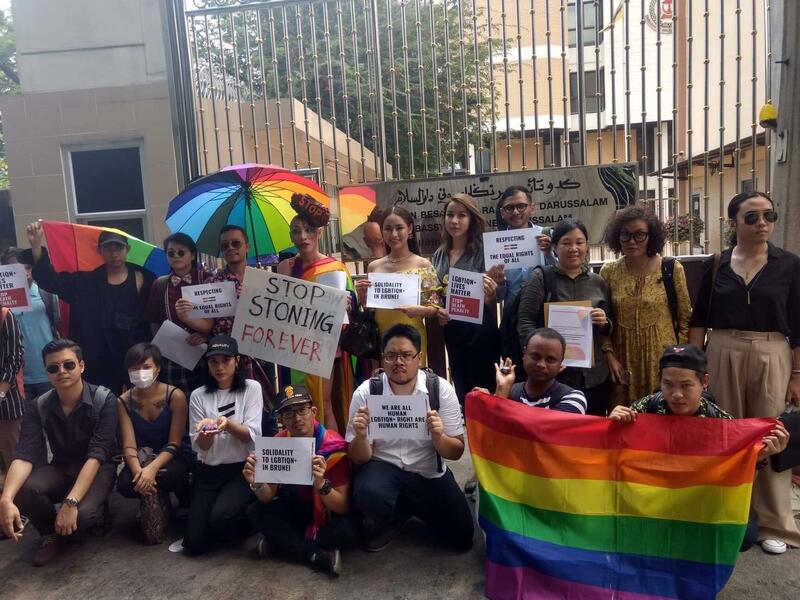 This week a group of more than 30 human rights activists, LGBTQIN+ activists and civil society representatives from Thailand and other South East Asian countries gathered in front of the Embassy of Brunei Darussalam in downtown Bangkok. They delivered a joint ASEAN civil society statement calling Brunei to halt the implementation of Sharia law which is against the human rights principles. The aim of this peaceful protest was to call on the government of Brunei to stop the enforcement of Sharia law which involved serve punishments such as cutting hands, hanging or throwing stones to death. This law would lead to human rights violations. 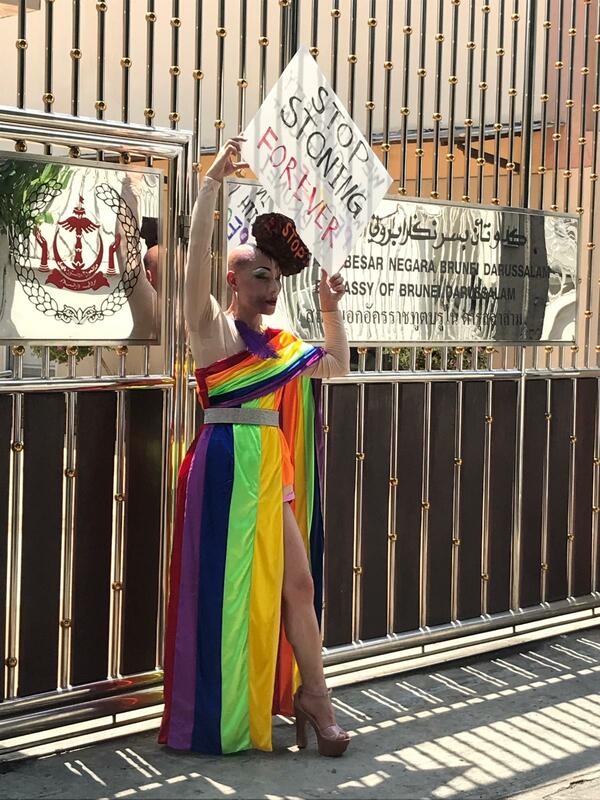 The protest was also a show of solidarity with LGBTQIN+ communities in Brunei. 132 across ASEAN (the Association of South East Asian Nations) civil society organizations joint statement urges the Government of Brunei to terminate the law which contradicts the principles of international human rights which Brunei abides with such as: the Universal Declaration of Human Rights Convention (UDHR), the Rights of Child Convention (CRC), the Elimination of All Forms of Forms of Discrimination against Women (CEDAW), Convention Against Torture and Other Cruel, Inhuman and Degrading Treatment or Punishment (CAT), the ASEAN Human Rights Declaration (AHRD) and the ASEAN Charter. Prasert Wasedueraman, the officer representing the Embassy of Brunei Darussalam accepted the submission of the statement read by the activist group. According to the officer, Wasedueraman would pass the statement to the ambassador of Brunei Darussalam to Thailand. 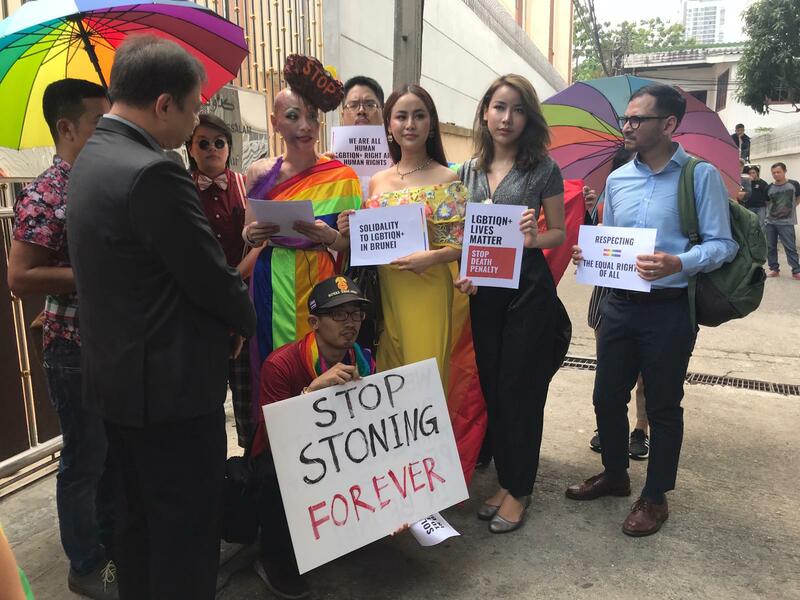 The protest reflects a milestone for human rights and LGBTQIN+ rights advocacy in South East Asia. All 132 ASEAN civil society organizations hope that Brunei would uphold its name being an “abode of peace”, a society that upholds and respects diversity, where difference is approached with compassion.